From the developers of Cut The Rope, top 25 games in both paid and free categories for several months running, and popular games in the puzzle genre, comes Robbery Bob their newest addition for iPhone or iPod Touch. 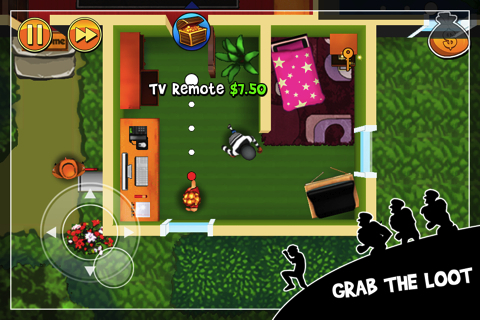 Robbery Bob has a good concept, not every day would you come across an iPhone app where you play the villain. You play Bob, in prison stripes and you have to steal to repay a mafia boss. The aim of the game is to grab everything that sparkles or a money bag symbol, and make your hasty exit before you get spotted by residents or caught by police. Beware the cops show up immediately and if you cannot out-run them in time the game is over. You can start off from where you left and you can retry levels indefinitely. You will open doors and grab valuables from multiple rooms, whizz past in plain sight, avoid traps and sticky situations. If you are lucky there are various exits but sometimes there is just the one you entered. Patience is the key to a good score. Every house resident walks in a set pattern which you must observe and make your move the moment they turn their backs. You will need to grab every little thing of value to boost your score, you are assessed by going undetected, time constraint, and value of loot. As of today’s review, there are 3 chapters (Suburbs, Downtown, and Secret Labs) before you have to fork out another $0.99 to unlock additional chapters. The Suburbs is where you start and you have 15 levels, or rather homes to rob. Instructions are easy and difficulty increases with level advancement, it starts to get tricky from level 7. Top-view and movement is directed by the on-screen remote control. The graphics are simple and sub-par considering Chillingo’s extensive experience in application creativity. Either my download is faulty or there really is no sound on my iOS 5 iPhone 4S. Paying $0.99 for the app I would have expected at least background sounds like the chatter of residents, door creaking, etc., but alas there was none when sound was on maximum setting. The thing which really bugged me was the misalignment of the compass controls. Bob seems to creep or run in a slant, I kept having to toggle between north and east to move him right. Bob’s tiptoeing movements are jerky and it gets annoying because he’s so slow. There is an option to run but apparently that is noisy and startles the residents, therefore I only reserve that for emergencies. I can purchase Bob’s shadow for $0.99 to distract residents with but I didn’t as I got too bored. 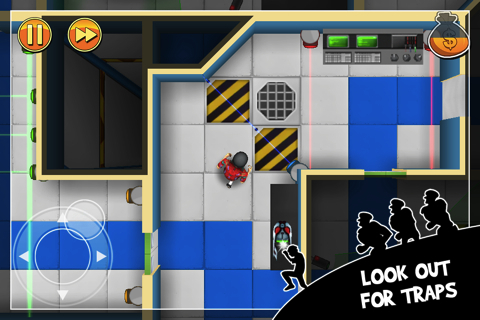 AppSafari review of Robbery Bob was written by Darius Reimm on June 29th, 2012 and categorized under Action, Adventure, App Store, Fun, Games. Page viewed 4486 times, 2 so far today. Need help on using these apps? Please read the Help Page.